I use both hard and soft cases. Bought a couple new, got a couple as gifts, but most have been bought at auctions. I have several real nice hard cases that I bought at auctions... probably didn't pay more than $15-20 for any of them. Only ones that go for more than $20 at auction are aluminum double rifle cases or Pelican cases. I really that SKB case shown in post #19 been wanting one like that for a long time. SKB makes good cases! For range travel I just use cheap soft cases. 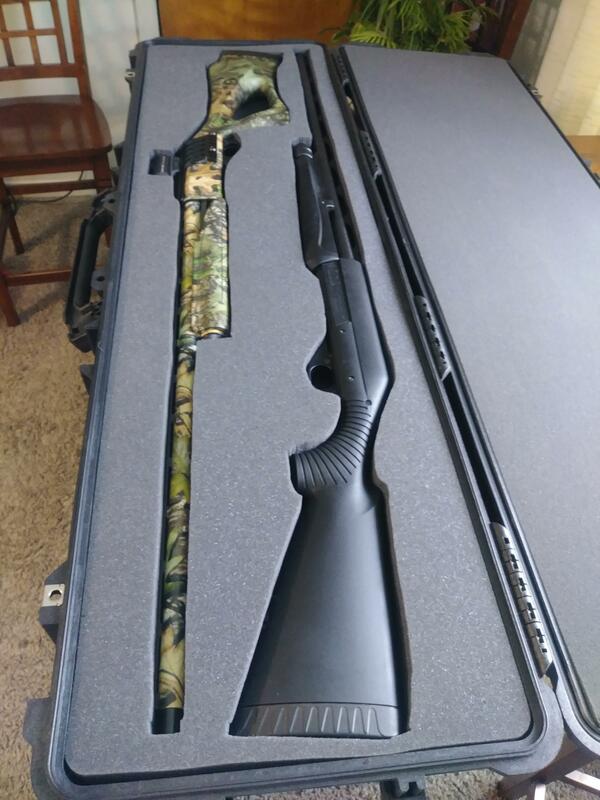 I have a Pelican double rifle case set up with 3 extra foam middle pieces that I use to transport my hunting rifles, one piece of foam is cut to carry 2 scoped rifles, another for 2 muzzys and a third for my turkey shotgun plus a backup pump shotgun. Here is a pic of the case with the shotgun insert. Here is the double rifle foam insert I cut out. I got tired of the Browning take down case my trap gun was in so I purchased a Pelican hard case with pick n pull foam. After I picked most of the foam and cut some of it I sprayed the remaining foam with black Plasti Dip to hold the pick n pull together better. PSA runs special s on their tactical cases from time to time for around $80 and will have 10 magazines included. Recently I was looking for a 24 inch case for an Encore pistol and a 32 inch case for an sbr. I found exactly what I was looking for with a couple cases from Savior. They are perfect for me. They each hold two guns and they are really low priced for the quality they exhibit. I also use jean pant legs for range transport. As far as a safe goes, they are not for thieves they are for protecting children and/ or the stupid. Years ago I picked up several airborne parachutist rifle cases. Really rugged & well padded. Made for the M1 rifle, so anything that size or smaller will fit. Just happened to pick another one up this weekend at a small gun show. Used & patched up but still very serviceable, couldn't go wrong for 20 bucks. Alstep I like these cases also one they don't scream rifle do to shape and they have a shoulder strap that's comfortable to use. I used one for my rifle at high power matches. I don't remember the brand name, Maybe Plano? Midway had a deal on them a couple of years ago so I bought one. A hard case. 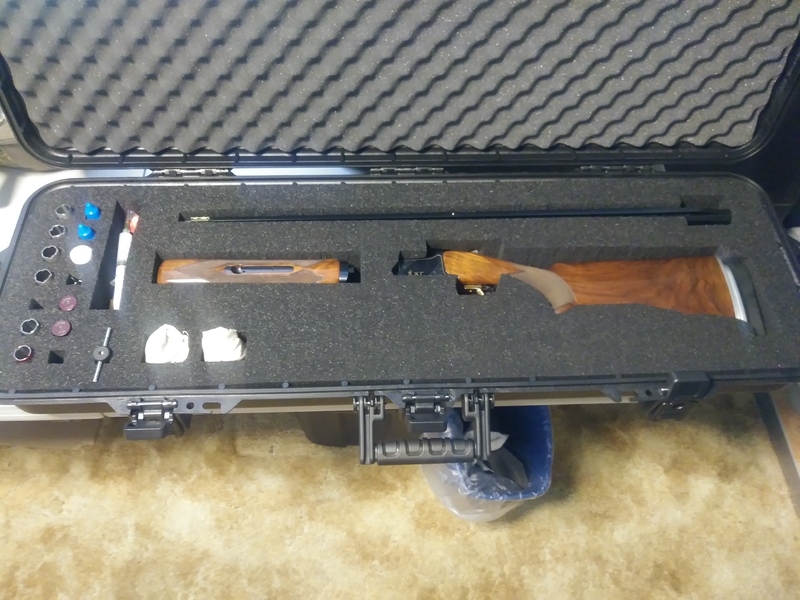 When it arrived I thought it was much longer than I would ever need and might even be clumsy, but then I figured out how to fit 2 lever action rifles and 2 six shooters into the case. Perfect for CAS events. My tacticool AR's/bull pups go into soft sided tactical cases I picked up on sale or came as freebies. One a Sig double case and the other a Kryptek double I got on sale. Handguns go into a Plano All Weather Tactical cases I got on sale with no foam removed. A few special rifles have their own Plano All weather cases, otherwise soft sided cases and tossed in the back of the Expedition. I like Boyt soft cases. The older ones were made in USA. The newer ones I believe are imported from China unfortunately. 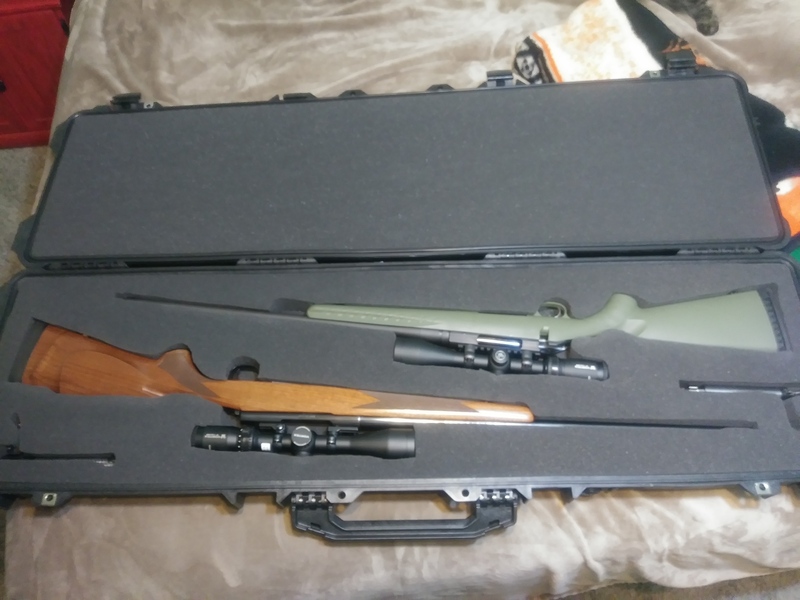 When going to the woods or a range, I love the Midway USA tactical cases. Inexpensive, durable, roomy, lots of pockets. They have very good zippers, and tough fabric outer. Well padded. For traditional muzzle loaders, handmade cases made from blankets and elk leather. I use a cheap $20 plastic case for transport. I got a Marlin 30-30 that had been fired 10 times for $50. one time. Totally functional, but also nice and rusty. I had a Uncle that poo-pooed the idea of one until he got back from Church one day and had been cleaned out. I had a Rockola M-1 Carbine I inherited and a Marlin model 39 stolen. They were both 'hidden' in a closet. Dogs for security? They're great until they get popped with a .22. A safe that will keep the high school kids out costs about the same as one decent rifle. You can move it yourself, and bolting it down is no big deal.